Miami-based JAXI Builders will build Allure, a community of luxury condominium residences in downtown Fort Myers beginning in 2017, with sales underway since early 2016. As part of their new presence in Southwest Florida, and in the downtown Fort Myers River District specifically, the developer wanted to show its commitment by contributing something for the overall good of the community. 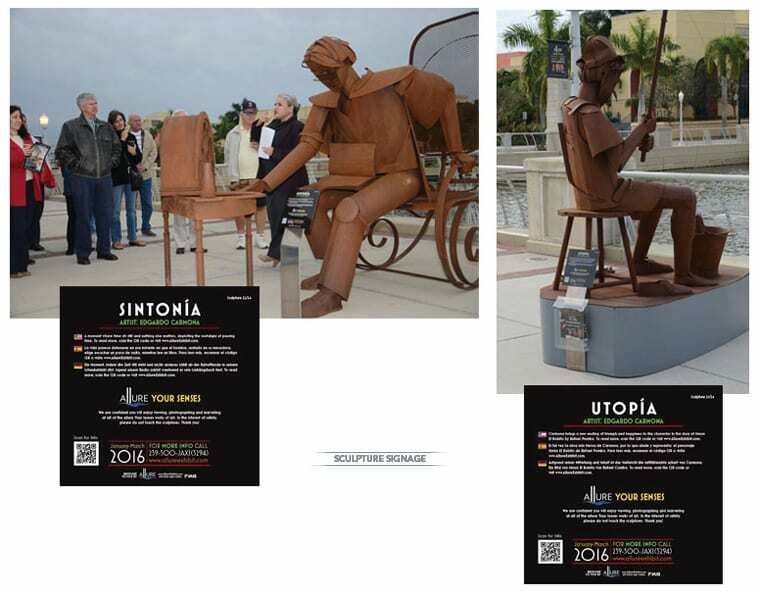 Working with the City of Fort Myers and the City’s Public Art Committee, the developer arranged to ship in and display a public art exhibit of 23 monumental iron sculptures by internationally acclaimed artist Edgardo Carmona of Cartagena, Colombia. The developer spent more than $150,000 to bring Edgardo’s exhibit from Paris, where it was one of only three exhibits ever allowed to be on display near the Eiffel Tower. 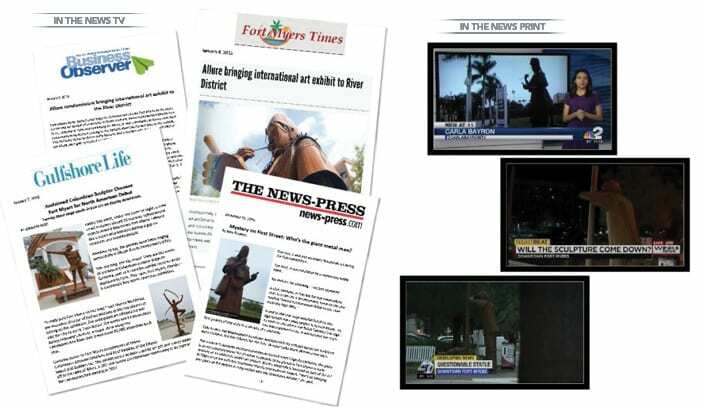 The exhibit would be displayed throughout the River District for residents and visitors alike to enjoy over a three-month period, and would also play a prominent part of ArtFest Fort Myers in February. As it turned out later, the exhibit would stay on display for additional months to further gain attention during the region’s “snowbird” and tourist season. The Brand Architects® at Spiro & Associates, the advertising and marketing Agency of Record for Allure and other local JAXI properties at the time, was tasked with providing public relations activities to create a buzz about the “Allure Your Senses” exhibit and its tie-in with the new community to come. Because this was the North American debut of Allure Your Senses, the Agency focused its attention on creating a multi-part plan that would garner significant coverage first locally, and then internationally as social media would exponentially increase the reach and attention. First, since the artist was going to be in town for a few days to tidy up some of the sculptures that had traveled all the way from France, we decided to hold a Meet the Artist event on a Monday evening in a fine bistro in downtown Fort Myers. A select group of 25 people from the City, Allure representatives, artist representatives and others would be invited to this soiree to meet Edgardo for the first time to talk about his artwork and vision for the exhibit while enjoying wine and heavy hors d’ouevres. Next, about four days later in the middle of the night, the developer would secretly position one of the sculptures near the property where Allure will be built, just to see what happens in terms of turning heads and creating a sense of curiosity and wonderment. Part of the strategy was to create significant media coverage and social media buzz. Certainly a reporter or two would inquire about it, and maybe a resident or guest would take some photos and share their find on social media. That one piece of artwork would just as secretly disappear within two days, hauled back to the warehouse where the others were locked up tight awaiting their debut. 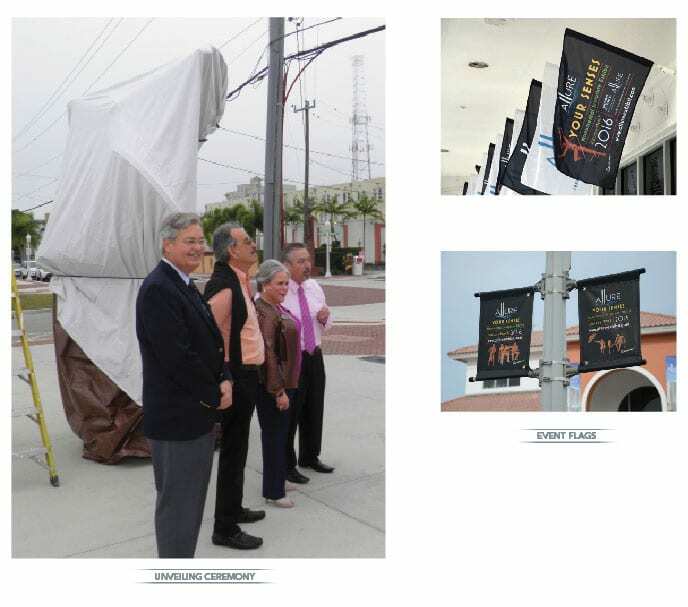 In early January, just a day or two before the exhibit’s debut and again under the cover of darkness, the developer arranged the sculptures over a number of public spaces in downtown Fort Myers in locations already identified by City officials and the Public Art Committee in this public private partnership. The developer’s representatives wrapped each sculpture so they could not be seen – a teaser of sorts – resulting in mystery. Massive pieces of something lie under wraps, but what could they be? We wanted people to continue talking about them. 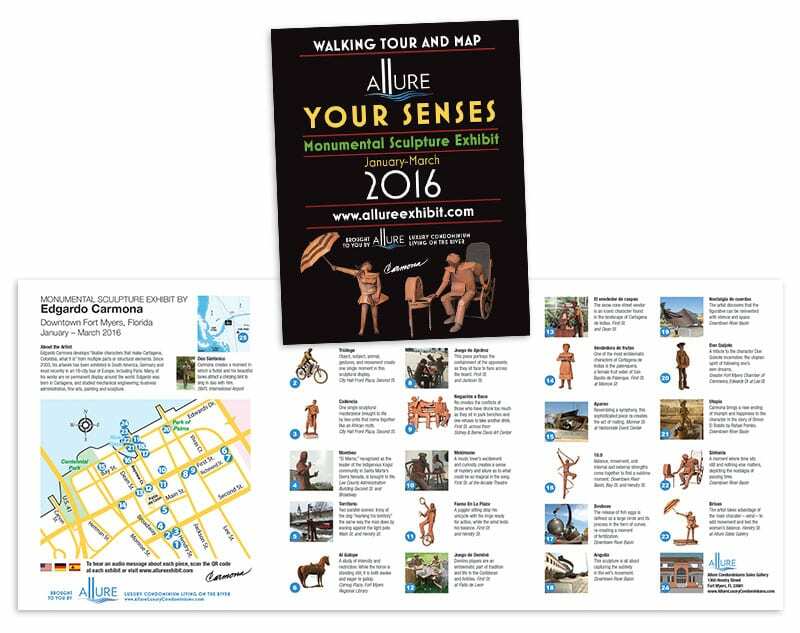 The Agency also created a foldout walking tour map that pinpointed the locations of and information about each sculpture, along with photos and an introduction to the new community of Allure coming to Fort Myers. Spiro & Associates also developed a website to features each sculpture, their locations and an expanded version of Edgardo Carmona’s vision for the exhibit. The website also included the back-story about each work of art with audio and text in English, Spanish and German. It is important to note here that it was critical for our strategy not to let these resources out to the public until the right time. Suspense was key. Next, the big idea: an unveiling event exclusively for the news media. The public relations department prepared and disseminated via email media advisories to alert the news about the event. We called approximately two dozen writers, editors and assignment editors to talk about the exhibit and to gain some level of commitment that they would send a crew. We even invited art writers from several other counties from Southeast Florida to the Greater Tampa Bay Region. 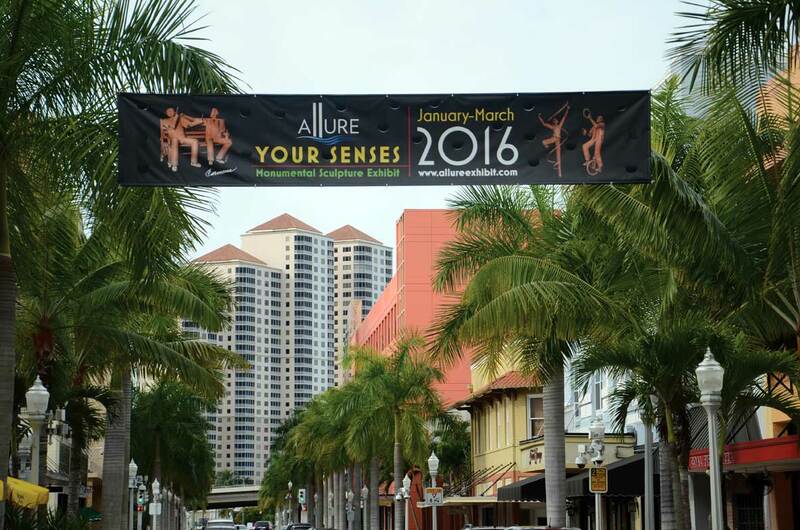 Massive banners touting the exhibit were specially made and hung on street light poles in the downtown area. A written plan laid out how the event would be presented, who would be speaking and other details to ensure the day would go off without a hitch. This all occurred over a period of about 10 days. We planned the big reveal for the news media for a Thursday morning via a guided walking tour to unwrap just four of the sculptures, with the remaining artwork being revealed to the public the following day. On the unveiling day, news media representing virtually every local print and broadcast TV outlet covered the event. The Mayor of Fort Myers addressed the crowd of about 100 people at the first unveiling, as did Edgardo Carmona, who brought his family with him to revel in the day’s excitement. As the guided tour went from sculpture to sculpture, Edgardo told the story of each sculpture through his translator, explaining how each unique piece came to be. Guests were delighted with the personal attention and fascinated by the backstories. The tour ended in mid morning at the Allure Sales Gallery, where the news media and other guests spoke with the developer and, through a Spanish translator, spoke to Edgardo. The group also enjoyed breakfast refreshments at the sales gallery, and had the opportunity to view a model condominium residence featuring vignettes of a living room, dining room and kitchen. Many had questions and discussions with the sales team. Hundreds of photographs were taken and dozens of articles were subsequently printed and posted online. All of the publicity resulted in a significant volume of positive earned media that would equate to tens of thousands of dollars of paid media. Social media was also ablaze with comments and photos. But an interesting turn of events would result in even more attention that would linger for months after the unveiling. A local businessman posted to social media what some people might consider a negative comment about one particular sculpture, one that portrayed a man and a dog “marking their territory” on a street light pole. As background, Carmona creates works of art based on his life experiences in his hometown of Cartegena. So just like the other 22 other pieces, this particular sculpture, “Territorio,” represents just one facet of life as seen through Carmona’s eyes. Every other one of the “likeable characters that make Cartegena what it is” shows people in his hometown. From a juggler on a unicycle, to people playing games of dominoes and chess, to a snow cone vendor in the streets – the entire collection when viewed as a whole comes together as a snapshot of Carmona’s vision. As word spread through social media, the Agency was able to take that one small lemon and squeeze it into a healthy dose of lemonade. More and more people joined the discussion to speak out in favor of the artwork – after all, the consensus was, that is what art is supposed to do. To create discussion and to express opinions, which exponentially grew across platforms as TV news and others covered the now expanding story multiple times. At this point, the Public Art Committee called a special session for the public to comment about the exhibit. As it turned out, several people spoke in favor of it and not one spoke against it. So the exhibit stayed, and the developer, the City, the community and artists in general enjoyed the overall positive nature of the display through July 2016. Suffice it to say the Agency successfully met its objective to earn a generous portion of media coverage and public comments about the exhibit and the new community on the client’s behalf. Some 17,000 mentions of the exhibit were identified in 35 media markets, and more than 9,000 social media posts mentioned Spiro & Associates. The City of Fort Myers says thousands of people both locally and from afar have come to see the exhibit, probably the largest number of people the downtown area has seen for one “event,” and maybe the only art exhibit to result in a downtown traffic jam.